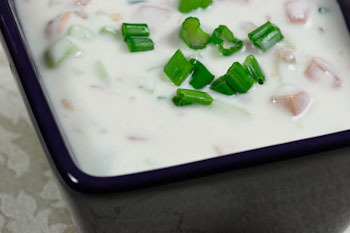 In a bowl, mix the yogurt, salt, and jalapenos. Before serving, stir in tomatoes and cucumbers. Garnish with cilantro and serve. This simple salad is a great accompaniment to any spicy rice dish. For best results, use salad or beefsteak tomatoes and Kirby cucumbers.